Fourth Grade Nothing: What's In My Trapper Keeper? Video Blog | Gimme A Break! What's In My Trapper Keeper? Video Blog | Gimme A Break! So what's in my trust old 1980s Trapper Keeper this Saturday? Why it's an autographed photo of the Gimme A Break! cast. 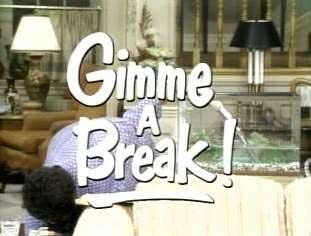 Gimme A Break was a popular NBC sitcom. The show had a pretty significant six year run from 1981-1987. The plot focused around the no-nonsense, but lovable Nell Carter who played a housekeeper and all-around house mom to a cop (Dolph Sweet) and his three teenage daughters, Katie (Kari Michaelsen), Julie (Lauri Hendler) and Samantha (Lara Jill Miller). I remember relating closet to Samantha as she was the youngest and closer to my age at the time.They added adorable cast members Joey Lawrence and little brother Matt Lawrence to the show which helped boost ratings I'm sure. So I'm guessing I wrote the Lawrence Brothers a letter and this was what they sent me in return. That was one of those shows that I watched more than I care to admit. Whenever anyone came into the room I had to turn the channel very quick. I just really liked those safe comedies. They were Disney before there were Disney shows. We got to see the Trapper Keeper!! Yeah!!! What? No mention of boyfriend Jonathan Silverman? I figured you had a major hottie crush on him. And wow, that was weird writing a statement like that. First I was having trouble uploading the video to YouTube so I used Google's video upload thingie. That crapped out. Somehow I magically got YouTube to upload it, not sure why it wasn't working the first time. May have been a software issue with our video cam?? Anyway, it should be working now. Thanks for letting me know! what other goodies are you hiding in your stash? I totally watched every episode of that show. I was sad when she died a few years ago. I used to love the show, and I saw Samantha/Laura Jill at a restaurant in the LA Marina (TGIFriday's) growing up. You're triggering all sorts of memories for me, growing up in LA. Thanks. I've got some blogging to do. I don't have a trapper keeper. That is so cool that you did that. Have a good one, Ally. The only thing I really remember about this show was the horrific theme song and her vacuuming up the fish. Oh, I remember that show, too! Loved Nell!